The thermostat wants to hold the coolant entry temp to 82°C (or thereabouts depending on which stat you have fitted) and at full load the delta across the engine will be 3-4°C so roughly 85-86 out and this is where the engine coolant temp (ECT) is measured. 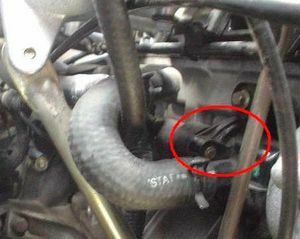 The coolant flow is then devided either to the top hose--> rad or to the heater/bypass and back to the stat. The proportion of flow depends on the position of the thermostat. The stat has a opening range of about 14°C so when the ECT is reading 99-100+ you know the stat is fully open and therefore most of the coolant is going through the rad. 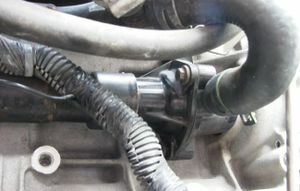 To hold a steady 99 top hose the rad must reduce the temp of the coolant by the 3-4°. More normally the stat will just run cracked open at 86-90 ish ECT. In this case not much coolant goes to the rad so if for example 25% is going that way then the radiator dT will be 16°C (25% at 70°C bottom hose + 75% bypass at 86°C = mixed temp of 82°C). At 10% rad flow the bottom hose would be at 40°C. In really cold ambient conditions the bottom hose can be cold (i.e. 20°C) and the stat has to just blend a tiny amount of cold in with the bulk of the hot bypass/heater flow. This is a worst point for the system. At VMax down a german autobahn in winter for example - very low overall coolant flow (the bypass /heater route is restrictive compared to the rad). If the mixing around the wax bulb of the stat isn't very good then it will tend to overshoot and hence the glugs of cold fluid coming through will give your engine a good thermal shock test which induces rapid metal contraction which is a big test for the head gasket. This page was last modified on 3 August 2007, at 08:54.